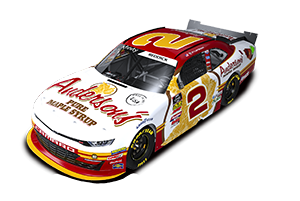 Anderson’s Pure Maple Syrup is proud to announce that Bubba Pollard / Pollard Motorsports is now part of Anderson’s Pure Maple Syrup Racing. Bubba is a very successful Super Late Model driver, based in Senoia, Georgia. He’s won numerous races throughout the south and more, racing in some of the biggest short track, asphalt-racing events throughout the country. Among his many wins, Bubba won the All American 400 last year at the Fairgrounds Speedway in Nashville, Tennessee. Bubba Pollard will mainly race in the Southern Super Series down south, driving the #26 Anderson’s Pure Maple Syrup sponsored racecar. Bubba also plans to race in numerous special events throughout the country. Driving the Anderson's Pure Maple Syrup/Pollard Motorsports #26, Bubba was running up front with the leaders the entire race, leading several times, and ended up finishing in 2nd. Driving the Anderson's Pure Maple Syrup/Pollard Motorsports #26, Bubba set fast time, started 6th after the invert and ran up front with the leaders for the entire race. With five laps to go, Bubba got around the leader and brought home another 1st place finish. This was Bubba's 6th Southern Super Series victory at this track, as he also won it in 2009, 2010, 2011, 2012 & 2014. Bubba again was one of the quickest cars in practice. He qualified 2nd but had to start at the back of the field because he needed to take the car out of pre-race impound to work on the motor. The race stayed green for all 100 laps, with Bubba working his way up to a very impressive 4th place finish. Driving his brand new Anderson's Pure Maple Syrup/Pollard Motorsports #26, Bubba set fast time and ran up front with the leaders for the entire race. On lap 48, he took the lead, but with only 10 laps to go, a caution came out. On the double file re-start, Bubba had the outside of the front row and quickly pulled away, leading to the finish. Bubba broke out his brand new Anderson's Pure Maple Syrup/Pollard Motorsports #26 and qualified 6th and ran up front with the leaders for the entire race. The 150 lap race had four stages, 35, 65, 35 and 15 laps with a 5 minute break at the end of each stage. Bubba won the second and third stages and was leading the final stage when a caution came out with one to go. On the Green, White, Checkered re-start, Bubba got caught-up on the outside and finished the race in 5th. Driving the Anderson's Pure Maple Syrup/Pollard Motorsports #26, Bubba qualified 3rd and started 10th after the invert, and ran up front with the leaders for the entire race. At the scheduled 10 minute break/pit stop, the Pollard Motorsports crew along with the help of Dennis Prunty and the DDP Motorsports crew, made several adjustments to the #26. Bubba then returned to the track for the final 100 lap portion of the race, leading the way for the last 42 laps and taking home the win. 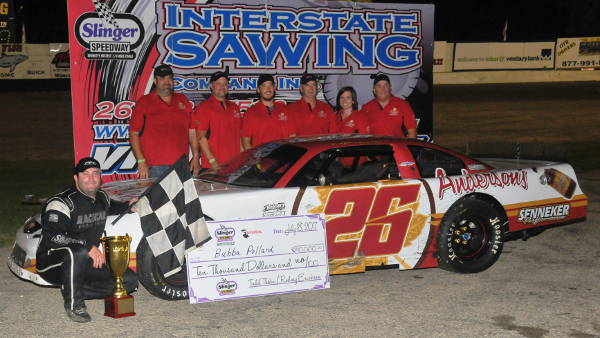 Bubba Pollard wins Slinger Nationals in his second try! Driving the Anderson's/Pollard Motorsports #26, Bubba was once again one of the fastest cars in the early practice sessions. He started the race in the 5th position and was running up front with the leaders when on lap 151, another car made contact with Bubba's car between turns 3 & 4, causing the #26 to skid sideways into turn 4 and onto the front stretch. As a result of this incident, Bubba was now in the 14th spot, still racing under green. He was able to race his way back up to 2nd and battle for 1st, when once again he got caught up in another incident between turns 3 & 4 on lap 359, when a car he was passing on the inside made contact with another car. One of those cars got turned sideways and came down the track and hit the #26 on the right front. Bubba's car suffered some serious damage and he had to bring it into the pits and was unable to return to the race. Even with this DNF, Bubba still took home 11th in the 23 car field. Driving the Anderson's/Pollard Motorsports #26, Bubba was the fastest car in the early practice sessions. He started the race in third position. After pitting around Lap 40 for right side tires, fuel and a couple minor adjustments, Bubba found himself in 11th, still on the lead lap. He held that position until the cars ahead of him needed to also pit. Bubba's strategy worked out perfectly because he now found himself running right up front, battling for the lead. Bubba took the lead with only about 20 or so Laps to go and never let up, finishing first. This was a very big win as this race was considered to be one of the biggest racing events on the 2017 racing calendar! Driving the Anderson's/Pollard Motorsports #26, Bubba was the fastest car in both practice sessions earlier in the day. When the night race got underway, Bubba, within the first several Laps, got hung-up on the outside line and quickly moved back to about 8th. Once back in line with the leaders, he was able to start passing cars ahead of him. With about 50 Laps to go in the race, Bubba took the lead to the finish, taking home 1st place. Pollard takes Anderson's Maple Syrup to Victory Lane in SC. Bubba, driving the Anderson's/Pollard Motorsports #26, set fast time and started the race in the 3rd position. Within a short time, Bubba was leading the race. At around the half way point, he elected to let the 2nd place car get around him, thinking that he would save his tires until the later laps. However, Bubba was unable to get back around the leader and finished 2nd.